Over 200 public and charter schools participated in this year's Clicks for Kids competition. Over 111,000 votes were cast and the three schools with the most votes were declared the lucky winners. Three area schools are preparing to make some purchases using funds they didn’t know they would have a few weeks ago. These schools are the winners of this year’s “Click for Kids” sweepstakes, sponsored by WTOP and Huntington Learning Center. This year’s grand prize winner is Clarksburg High School in Montgomery County and for getting the most votes, the school will have an extra $10,000 to use this year. “Oh we are thrilled!” said Principal Edward Owusu. Over 200 public and charter schools participated in this year’s competition. Over 111,000 votes were cast and the three schools with the most votes were declared the winners. Coming in first place was J. Michael Lunsford Middle School, which will receive a check for $7,500. “It’s pretty exciting, the kids keep asking me about it and what we are going to do with all of this money,” said Principal Carrie Simms. In second place with a $5,000 award is Eastern Middle School in Silver Spring. “It’s pretty awesome,” said Principal Matt Johnson after learning that his school had won. The three principals agreed that the contest brought the schools closer together with their communities, and in some cases connected them with past alumni who wanted to help get out the vote. Clarksburg’s principal said he heard from former students who haven’t walked the halls of the schools for many years. “That’s nice to see that they have not forgotten their high school and their community,” Owusu said. Principal Simms said Lunsford Middle School used their overcrowded halls to their advantage. With the help of students, their families and staff, they were able to rally lots of support. In the days leading up to the final day of voting, Simms said the leader board really energized the troops. “We looked at it and went ‘Oh my gosh, we’re close. Let’s really push our efforts forward on this,'” Simms said. She said messages urging people to vote for Lunsford spread on Facebook and Twitter and, in some cases, students of other schools and their families jumped behind Lunsford when they realized their school probably wouldn’t win. For Eastern’s principal, Johnson said it was amazing to watch the school get “jazzed up” during the contest and really band together to win. “We all pull together for sports, clubs, this kind of click it for the students competitions,” Johnson said. So what is a school to do with a few thousand extra dollars? Johnson said Eastern High School will use their winnings to buy more Chromebook computers for students and put some cash toward after school programs. “That kind of money isn’t always budgeted,” Johnson said. Simms said one idea for how Lunsford Middle will spend the money came from a student. 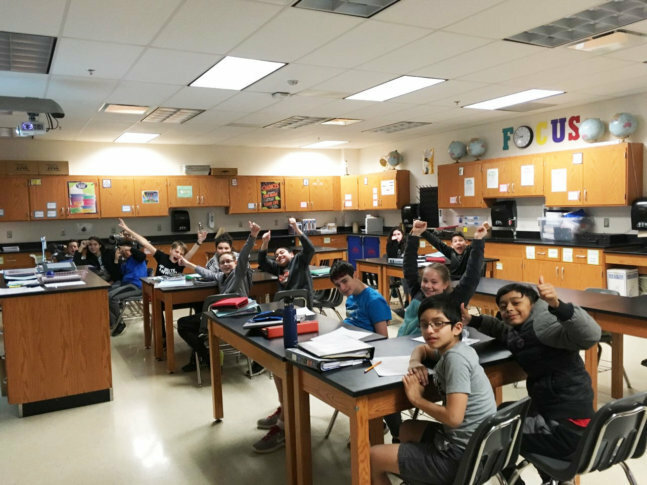 “I did have a student say, ‘You know Ms. Simms, Loudoun County already has so much, why don’t we do something that does something for somebody else?’ and I thought that was a fantastic idea,” Simms said. While Loudoun is widely known as an affluent county, it is also home to several schools that serve children from low income families. The school plans to give $1,500 to a sister school Simms said serves many of those students. Simms said the remaining money will go toward purchasing technical equipment for Lunsford’s special education program and funding a program that encourages positive behavior from students. “To get all of our kids in our building knowing what it’s like to have the characteristics of responsibility, respect, ownership and achievement,” Simms said. As for the grand prize winning Clarksburg High, Principal Owusu said the money will go to developing more college level courses for students. It will also help the school fund field trips aimed at assisting students with college and career decisions. “This money can definitely help many, many students,” Owusu said. All the principals thanked their communities, saying they couldn’t have won without the help of all those who supported their schools. “I am talking not just about South Riding, but Loudoun County in general and to WTOP for giving back to all of our schools,” Simms said. Owusu also had words of praise for the annual contest hosted by WTOP. “I’d like to thank WTOP and Huntington Learning Center, I think it is great that you do this,” said Owusu. WTOP General Manager Joel Oxley said the contest is part of WTOP’s long-standing commitment to helping children in our communities. “We are thrilled to partner with Huntington Learning Center on ‘Click for Kids’ to once again aid three very deserving schools,” Oxley said.